ATOPALM Holiday Kits 50% Off! Shop All Kits at 50% off! December deals are here! All ATOPALM kits are 50% off retail price for a limited time only. These perfect “all-in-ones” make a great gift for a loved one, or a special deal all for yourself. Each kit features one full size product, and multiple mid-size products. It’s a great way to try new ATOPALM products at a low price. Read on to learn more about each kit — the first product featured will be your full size product. Cicarelief Cream is a repairing cream designed for skin that needs “something extra” to feel and look its best. Calamine thoroughly calms irritation and redness while MLE heals and supports the skin’s lipid layer. These two actions go a long way toward caring for irritated, sensitive skin. Extreme Cream Mask is a face mask available exclusively in this kit! Its firming, moisturizing formulation works to reinforce the skin’s barrier while improving youthful traits like firmness and elasticity. Intense Moisture Cream is a rich, best-selling cream that forms a 48-hour hydrating skin barrier with MLE and hyaluronic acid — a powerful hydrator that attracts up to 1,000 times its own weight in water to the surface of the skin! Eye Contour Cream is a total anti-aging cream for your eye and mouth zones. It helps smooth away fine lines while enhancing skin elasticity and moisture with MLE and hyaluronic acid. Click here to add Cica Kit to cart and save 50%! Extreme Cream deeply moisturizes skin with a unique 72-hour moisturizing effect. A patented ceramide complex combines with panthenol, madecassoside, allantoin, and anti-aging Idealift to create a multi-function formula that is truly extreme. Essence Mist is one of our popular spray-on moisturizing mists. 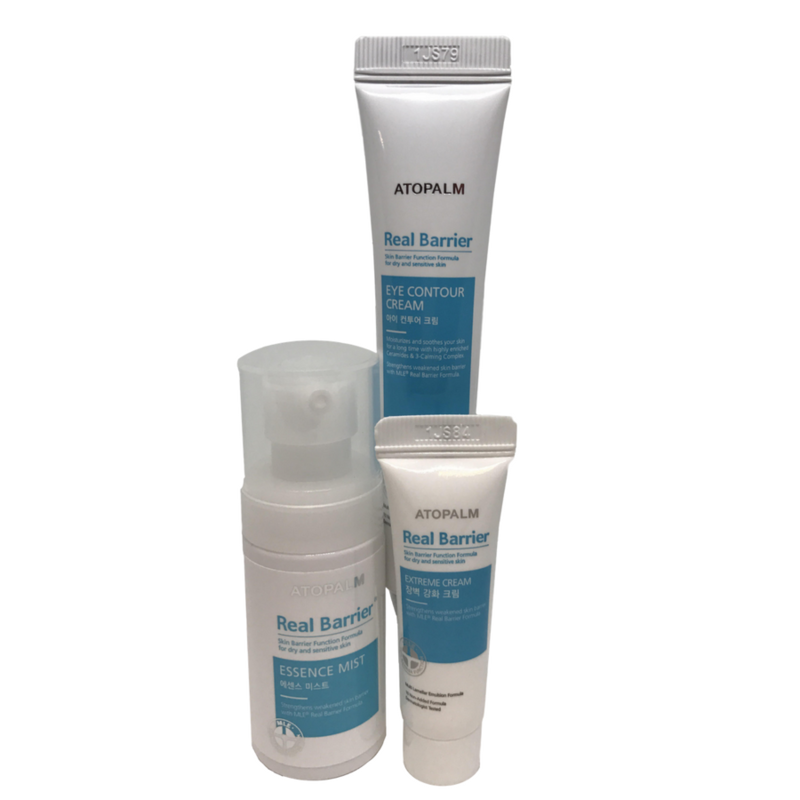 It helps relieve dry skin on the face and body while soothing irritation with the Real Barrier three-calming complex. Eye Contour Cream, as mentioned above, is an anti-aging cream designed to be used around the eyes and mouth, where skin ages soonest. 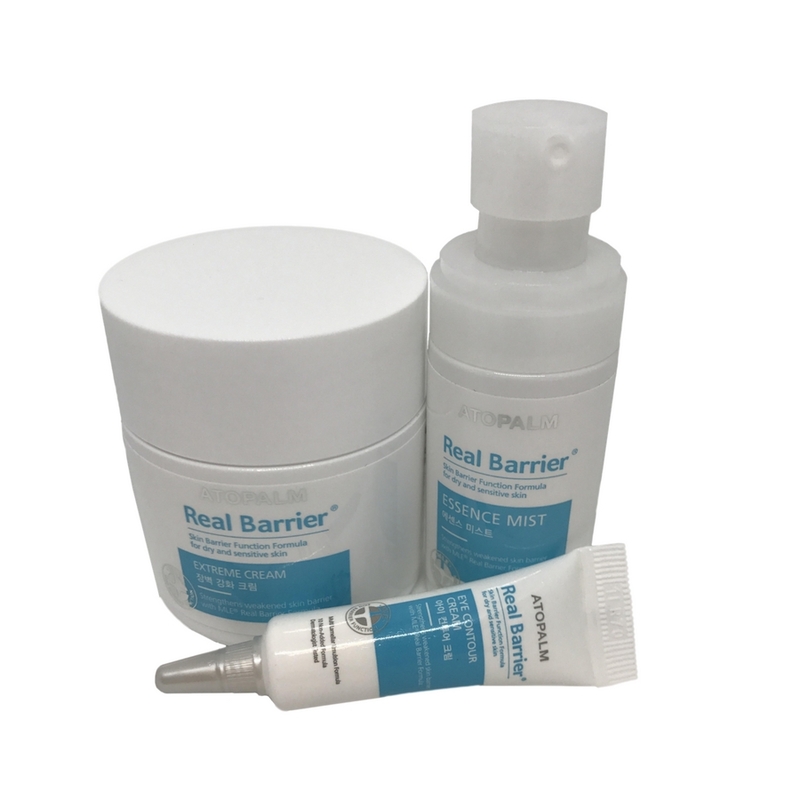 It’s perfect for all skin types in need of true eye and lip care! Click here to add Extreme Kit to cart and save 50%! Eye Contour Cream is clearly a must-have product to be featured in all three kits! Don’t let your eye and mouth areas fall victim to premature signs of aging — let this cream’s patented ceramides, hyaluronic acid, and anti-aging ingredients keep the eyes and mouth looking healthy and youthful. Extreme Cream is one of ATOPALM’s most comprehensive formulas. It is deeply soothing and provides up to 72 hours of continuous hydration — a lifesaver for very dry skin types. Essence Mist is the perfect product for on-the-go or quick moisture. It can be used on skin from head to toe, making it great for throwing in your suitcase for a holiday weekend getaway. Click here to add Eye Contour Cream Kit to cart and save 50%!